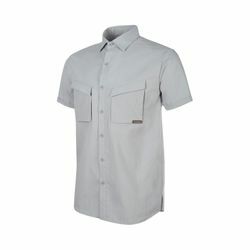 Mammut Belluno Shirt. A trendy take on a functional hiking shirt: the Belluno Shirt Men is made from a lightweight material - because out in the mountains less weight means more performance. It impresses with stretch properties allowing greater freedom of movement and a fashionable seersucker effect. Coolmax® technology ensures optimum moisture-wicking together with high breathability. Perfect for mountain biking or a relaxed hike.